His absence this year will have as much impact as his presence would have. The death of Supreme Court Justice Antonin Scalia is a sad and tragic event for his loved ones, including 28 grandchildren and a large network of admirers. The political stakes for the country, its governing institutions, and, yes, the planet dwarf them in scale. The mortality of Supreme Court Justices is an element of wild randomness in the American political system. Enormous stakes rest upon the frail vulnerabilities of human flesh. Thurgood Marshall’s retirement 13 months before the 1992 presidential election, and two years before his death, paved the way for his replacement by Clarence Thomas. In today’s polarized era, no justice who had the physical ability to stay on would depart a Supreme Court seat under an opposing-party president. Whether and how the current system can handle these jolts of random chance is an open question. The immediate and easily foreseeable impact is staggering. Last week, the Supreme Court issued a stay delaying the implementation of Obama’s Clean Power Plan. The stay indicated that a majority of the justices foresee a reasonably high likelihood that they would ultimately strike down Obama’s plan, which could jeopardize the Paris climate agreement and leave greenhouse gasses unchecked. Without Scalia on the Court, the odds of this drop to virtually zero. The challenge is set to be decided by a D.C. Circuit panel composed of a majority of Democratic appointees, which will almost certainly uphold the regulations. If the plan is upheld, it would require a majority of the Court to strike it down. With the Court now tied 4-4, such a ruling now seems nearly impossible. Even if the Senate does not confirm any successor, then, Scalia’s absence alone reshapes the Court. Modern conservative legal doctrine has moved toward a form of aggressive judicial activism, devising — or, more precisely, resurrecting — theories that allow the Court to strike down vast swaths of laws conservatives find objectionable. Activist Courts require a majority. That is now gone. Senate must simply refuse to appoint anybody. 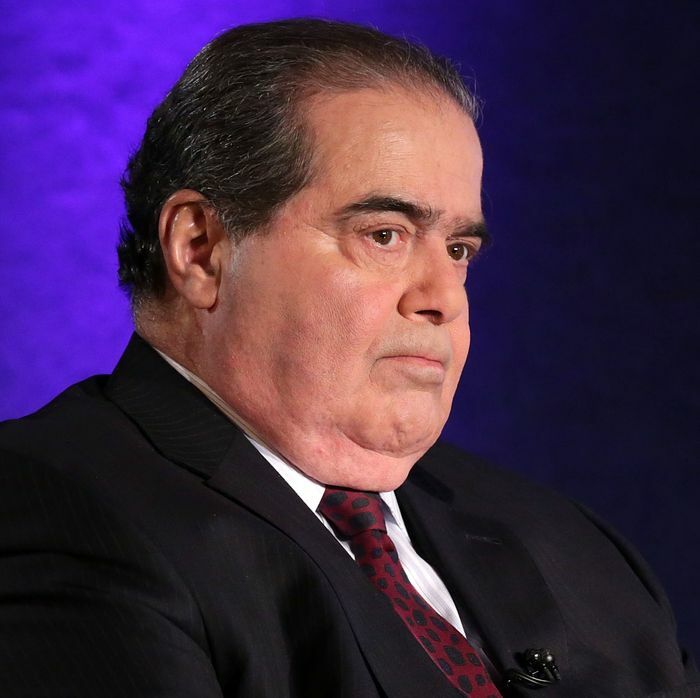 Would be outrageous to replace a giant like Scalia with a minnow like Sotomayor. If Scalia has actually passed away, the Senate must refuse to confirm any justices in 2016 and leave the nomination to the next president. Obama has no reason to comply with such a policy, of course. On the other hand, the Republicans in the Senate have no reason to confirm his appointee when they believe they stand a chance to take back the White House and put their own justice in place. And Obama can try to pressure the blue state Republicans up for reelection this term, but the odds of him winning the four necessary Republicans are probably not strong. The issue is likely to dominate this year’s Senate races in competitive blue states where control of the chamber lies. What’s more, it cannot even be taken for granted that, if Democrats win in November, Republicans will allow a Democratic justice to replace Scalia in 2017, either. Senators used to furnish what were viewed as qualified mainstream appointees with wide, bipartisan support. Increasingly, Senators vote against any justice nominated by a president of the opposing party. The notion that the Senate needs to let the president appoint somebody to a vacant Supreme Court seat is nothing but a social norm, and social norms in modern politics have a short lifespan.